With Hyperion's complete set of Strauss Lieder past the half-way mark, these two recitals, from Inger Dam-Jensen and Camilla Tilling, further reflect today's welcome view that there's more to Strauss as song composer than just the usual dozen favourites. Of course, between the two discs we have several of the best-loved songs but it's interesting that both feature the Drei Lieder der Ophelia, Op.67, disturbing portraits of Shakespeare's heroine in despair that are among the least easily accessible of the songs. Both these sopranos are fine singers, well known to opera and concert goers all over the world, and they share an operatic repertory that includes Pamina, Sophie in Der Rosenkavalier and Susanna in Figaro. The older singer, Dam-Jensen's repertoire is broader and coincidentally includes another Ophelia, that of Ambroise Thomas's operatic Hamlet. Those who saw the second cast of the Royal Opera's recent Hänsel und Gretel will have been impressed by Tilling's pleasing, lyric voice and engaging stage presence. These characteristics come across in abundance on this new disc while Dam-Jensen, unfortunately, is not heard at her best. Tilling starts with 'Rote Rosen' (1883) – the early song that gives the disc its title (and colour-scheme) – followed by 'Malven' (1948): two songs from either end of Strauss's composing life. In between we have favourites such as 'Cäcilie', 'Befreit', 'Allerseelen' and 'Das Rosenband', along with a beautifully swooning account of 'Ich Schwebe' and a reading of 'Schlechtes Wetter' which judges the transition from the hostile outdoors (Paul Rivinius picking out each raindrop with great precision) and the comfort of the fire-side. Strauss's demanding writing holds no fears for Tilling's technique or vocal range and it's a constant pleasure to hear her negotiate the sometimes fearsome tessitura with apparent ease, the voice maintaining its attractive lightness and bloom throughout, warmed with a delicate vibrato. I was not terribly convinced by the addition of violinist Ulf Wallin for the final song, 'Morgen'; despite Strauss's sanctioning of this, it unbalances the relationship between singer and accompaniment. This is my only major reservation, though, and Tilling is, on the whole, beyong reproach. She manages the meandering melismas of 'Malven' with expert control and the soaring climax of 'Mein Auge' is despatched with ease. Some might wish for greater heft for the bigger songs – her 'Befreit' inevitably pales in comparison to Jessye Norman's grand account, to name but one bigger voice in this repertoire – but Tilling cleverly avoids trying to push her voice beyond its natural limits. Her Ophelia-Lieder might seem a little light-weight emotionally, yet her girlish, vocally immaculate way with them detracts little from their disturbing character. She still unleashes some fearsome 'Tod's in the first and is skittish and unhinged in the second. She is also helped by the detached almost automatic character Rivinius brings to his accompaniment. Where the Ophelia-Lieder come at the middle of Tilling's programme, Dam-Jensen places them at the end of hers, and as she employs her considerable acting skill in them they are probably one of the most successful parts of her recital. Nowhere on the disc does she sound entirely comfortable vocally, but here at least the unsure intonation can be understood as a not entirely unconvincing part of her interpretative strategy. Elsewhere, however, where Strauss calls for a vocal line to be produced with security and allure, Dam-Jensen is too often simply unable to deliver. The biggest problem is her unsure intonation which varies from mildly worrying, as in her performance of 'Ständchen', to frankly uncomfortable, as is the case with her 'Allerseelen' where she spends much of the time under the note and is way off on the floated F sharp at 'süßen blicke' half way through (a moment that Tilling manages beautifully). This vocal insecurity seems also to hold the performances back so that passion is often wanting, such as in a rather flaccid 'Liebeshymnus' and an earthbound 'Zueignung', and humour sounds a little laboured. Her diction is also often rather muddy, a result of the vocal effort, one suspects. She is better in three of the Op.68 Brentano settings, turning in a lively account of 'Amor', for example, and strangely has fewer problems with intonation in these longer, vocally challenging songs. Her 'Wiegenlied' gives us a nicely spun line but here, as well as intonation that is less than spot-on, the voice itself is simply less seductive than many of the other singers to have tackled this repertoire. Malcolm Martineau provides highly polished and professional accompaniment but there's little evidence of singer and pianist spurring each other on. 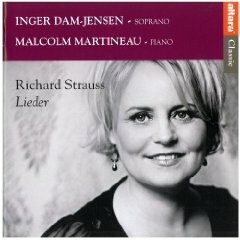 It sounds as though Dam-Jensen was having a bad day for some of these songs, and this recital is an imperfect record of a usually excellent singer; in an already crowded field it can only really be recommended to her fans. Tilling's recital, on the other hand, is a very enjoyable, fresh-sounding disc that lets us here some of these songs with a wide-eyed ardour sometimes missing from bigger-voiced performers. The BIS disc is a Hybrid SACD with full texts and translation; Altara only provide English translations pointing us to their website for texts. For a full-price disc, that strikes me as rather stingy.